Andrew and I were recently in Eugene, OR getting our kids settled into the University of Oregon (go Ducks lol!). 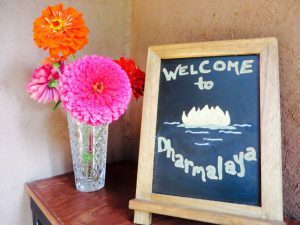 During our week up there, we had the pleasure of staying in the Dharma Suite at Dharmalaya and can we just say “WOW!!!”? 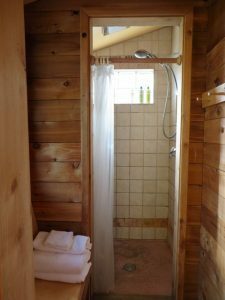 We are sharing some information about this incredibly affordable straw bale retreat center because we think most of you would love it. 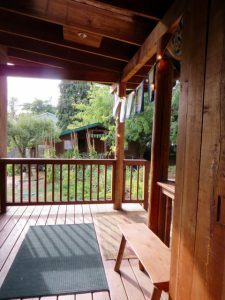 Dharmalaya sits on nearly one acre in Eugene and is a model for straw bale construction, permaculture, and intentional community living. 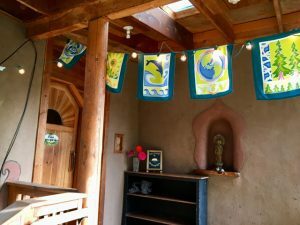 Upon entering the compound, we felt like we were stepping into a magical landscape; fruit trees, a bath house, pond, gardens, and of course the stunning straw bale retreat center in which the Dharma Suite lies. The grounds are beautifully kept and our host, Michele, was delightful, making sure we had what we needed. 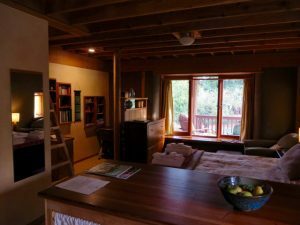 Walking into the Dharma Suite, our expectations were far exceeded. 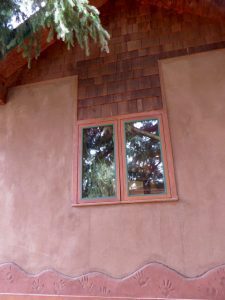 The warmth of the thick straw bale walls, the exposed timbers, the beauty of the earthen plaster all combined to create a truly beautiful ambiance. 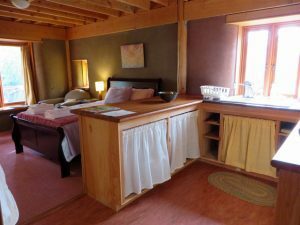 The suite has a sizable kitchenette with a mini-fridge, electric kettle, large sink, and tons of counter space. It was loaded with goodies such as fresh fruit, oatmeal, chilled beverages, and a wide selection of teas. There were plenty of plates, mugs, glasses, and flatware. We had ample space for all of our food provisions during our time there. The bed is quite comfortable and cozy and I spent many hours there, reading from some of the interesting books and magazines found on the bookshelves. We had plenty of space for our clothes (hanging and folded items alike) which is sometimes a rarity in AirBnB style accommodations. We also enjoyed the charming writing desk nested into the back corner. A ladder by the closet led up into a loft where we found a nice double bed, allowing for an additional two guests. Dharma Suite is found within the Dharmalaya building but has its own sense of privacy. 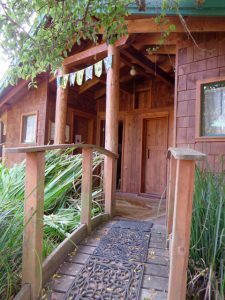 Guests are invited to use the large, open space in the main retreat studio for doing yoga, meditation, or just slowing down. They’re also welcome to join the center’s yoga classes at no charge and even to participate in their Sunday singing and meditation group. 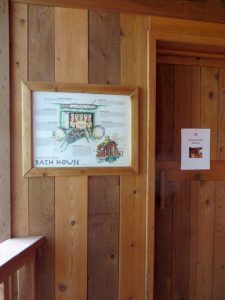 The bath house is charming and guest of the Dharma Suite their own private bathroom and shower rooms. 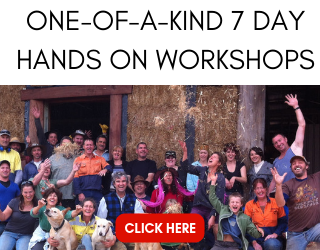 The center was founded in 2002 and the straw bale structure was built with community help during a hands on workshop. To this day the building looks as good as it did when first built. Andrew was so impressed by the natural plaster job done 15 years ago that he asked Michele for more information on their recipe. 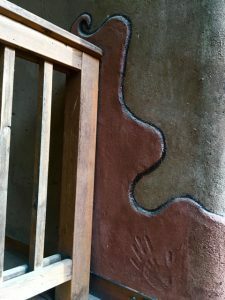 Getting that type of longevity with Natural Hydraulic Lime (NHL) plaster is one thing, but with earthen plaster, it’s much more challenging. 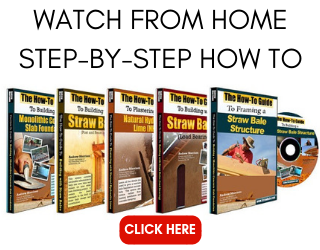 It’s really a stunning example of straw bale construction. 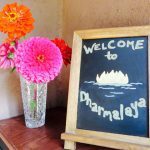 For any of you feeling burned out by day-to-day life and/or wanting to exercise loving self care, Dharmalaya provides the sanctuary. 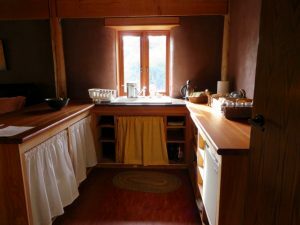 For an incredibly affordable price you can have a one of a kind getaway while staying in a stunning straw bale retreat. 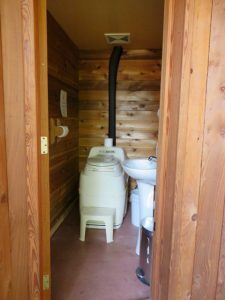 And because the Eugene area has so much to offer to support your vacation/retreat (i.e., natural hot springs, miles of hiking, dozens of lakes and rivers, healthy food, etc), it really is the perfect location for an unforgettable experience. 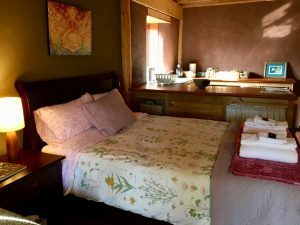 You can find out more about PROUT here and how to book the Dharma Suite here. 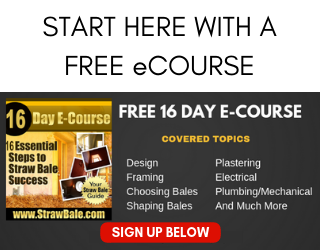 4 Responses to Affordable Straw Bale Retreat Opportunity! I don’t see any info about how to contact you if you are interested in staying at the retreat location. This is great. 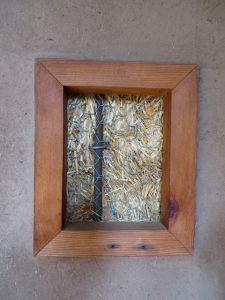 I love all the projects I have seen you post over the years. Hi Renelle. 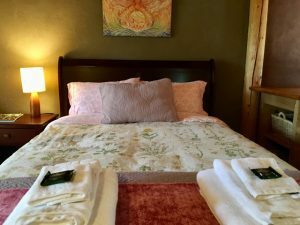 You can contact the retreat center through the Air BnB page, which is listed in the blog post. 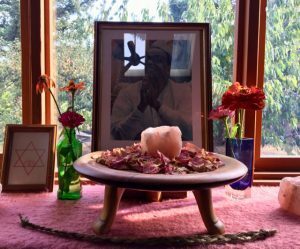 We are not directly affiliated with the retreat center other than we stayed there ourselves and shared our experience with you all. Hope that helps! Thanks to both of you for the constant flow of interesting and inspiring information. Your pictures are great! Thank you!